Works great for busy adult writers who need two hours of uninterrupted writing time. No cell phones. No critiques. JUST WRITE! Our group rotates among three Eastside Tucson locations. We begin at 11:30 but gather @ 11:15. Ten minutes of writing talk, stating intentions for the two-hour writing session, and then writing on your own project—longhand, computer etc. Feel free to bring snack. Hostess provides beverages. No time to write? No place in your house for quiet? Too many digital temptations or house/family chores? Commit and claim your two hours each Tuesday just for you and your writing. Sometimes we’re in the groove and the writing goes on for more than two hours. Set your writing intention each week in a quiet, serene atmosphere. No interruptions. No cell phones. No fee. Join us each week or as your time allows. 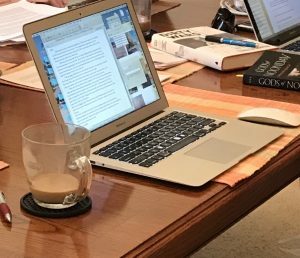 A writing support group for adult writers. Two hours of quiet writing time. Wireless networking available. Hostess provides beverages. Feel free to bring a snack. We begin at 11:30 but gather @ 11:15. Ten min. of writing talk, stating intentions for the two-hour writing session, and then writing on your own project—longhand, computer etc. Interested writers may contact Ethel here. Two hours of quiet writing time. Wireless networking available. Hostess provides beverages. Feel free to bring a snack. 6:00 PM Let the reading begin! Open to the public. A family-friendly event. Sunday, March 3 9:15-10:30 AM. Stop by the WHEATMARK booth at the Tucson Festival of Books to say hi. We can talk about books, writing, sharing stories, and you can purchase copies of my books. Thinking of Miller Place: A Memoir of Summer Comfort– perfect for twins, parents of twins, New York transplants, and anyone who remembers the nostalgia of growing up in the ‘50s and ‘60s. Seedlings, Stories of Relationshipsholds a garden of true stories and a few BOTS (based on a true story) about all kinds of relationships written with humor, poignant reminiscing, or straightforward telling it like it is (or was). Stories Abound from the Tucson Tellers of Tales! I’m telling … stories, that is. And I’ll have books for sale. hThinking of Miller Place: A Memoir of Summer Comfort– perfect for twins, parents of twins, New York transplants, and anyone who remembers the nostalgia of growing up in the ‘50s and ‘60s. Seedlings, Stories of Relationships holds a garden of true stories and a few BOTS (based on a true story) about all kinds of relationships written with humor, poignant reminiscing, or straightforward telling it like it is (or was).